A staph infection is an infection caused by the staphylococcus bacteria. The most common type of infection causing staph is staphylococcus aureus, but there are many types of staph. Skin infections are the most common infections caused by staph, but staph can be present in infections in many other parts of the body ranging from incision sites, the heart and the brain. In many, staph is found on the skin and in the respiratory tract as part of the "normal flora" bacteria that lives on the body. The presence of staph can be completely normal and may not cause health problems in healthy individuals. When a staph infection is present, the severity can range from a minor skin infection that heals itself to a wide-spread systemic infection that can be life-threatening. Staph is often responsible for common minor infections, such as boils, pimples, and impetigo, but it can also be the cause of cellulitis, pneumonia, meningitis and endocarditis. Sepsis, toxic shock syndrome and osteomyelitis are also among the most serious conditions that can be caused by staph. After surgery, there is a risk of the incision and underlying structures becoming infected with staph, as the incision gives the bacteria direct access to the tissues and structures normally protected by intact skin. Staph is one of the most common types of infection after surgery, whether that is a minor outpatient surgery, such as an ingrown toenail removal, or a more complex surgery. The treatment of choice for a staph infection initially was penicillin; however, many strains of staph are now penicillin resistant, meaning that they no longer respond to treatment with penicillin. When penicillin resistance became common, methicillin was then used to treat staph infections. Methicillin-Resistant Staphylococcus Aureus (MRSA), was initially rare outside of hospital acquired infections but now is becoming far more common in infections that start outside of the hospital setting. MRSA, like staph aureus, can be present in healthy individuals without causing sickness, but can also lead to life-threatening infections. When MRSA is suspected, alternative antibiotics such as clindamycin or linezolid are typically used. A culture and sensitivity, a test that determines not only the bacteria causing the infection but also what antibiotics would offer the best treatment for that particular bacteria, is typically done prior to any antibiotics being given. Vancomycin Resistant Staphylococcus Aureus (VRSA) is also a potential threat, but there have been a minuscule number of cases at this time in the United States. VRSA is a staph infection that does not respond to vancomycin, which is often used in the treatment of serious MRSA infections that are life-threatening. This type of infection is extremely serious, as most of these patients have already failed to respond to other types of antibiotics when vancomycin is given. Staph infections, including MRSA, are best prevented by good hand hygiene. Hand washing with soap and water is the best way to prevent the spread of staph, and in the hospital setting special antimicrobial soaps such as Chlorhexidine may be used. For surgery patients, infection may be prevented with good incision care. For hospitalized patients who have MRSA, isolation precautions don't help treat the infection but prevent the spread of infection to other patients. 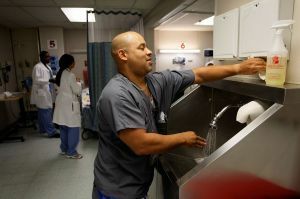 This means that the hospital staff will wear disposable gowns and gloves, and use disposable equipment such as stethoscopes to prevent the infection from spreading. The door to the patient's room may also be kept closed. Some risks factors for developing a staph infection include having a surgical incision, being hospitalized, crowded living conditions, having a compromised immune system, diabetes, being very young or very old, and frequent urinary tract infections in women. The safe answer is this: don't ignore a potential infection, and if there are any indications that it might be serious--such as redness, fever, chills, body aches, or drainage-- seek medical attention immediately.